Published: June 18, 2014 at 05:43 p.m. 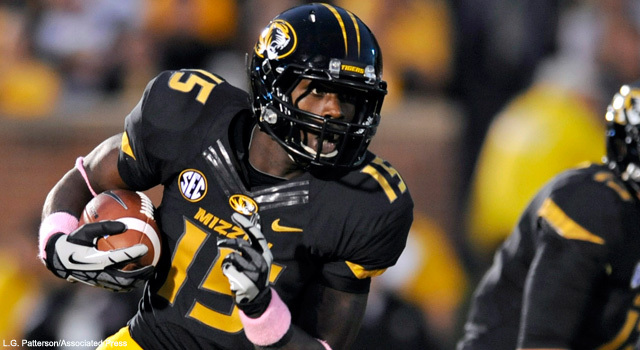 Updated: June 20, 2014 at 12:53 a.m.
Former Missouri WR Dorial Green-Beckham's plans for the 2014 season remain a mystery. The weeks-long delay in a decision from former Missouri wide receiver Dorial Green-Beckham's about his future plans -- to either transfer to a small college or sit out the season before entering 2015 NFL Draft -- might now have its explanation: a third possibility. There is at least "marginal interest" in a transfer that would bring the troubled underclassman to Oklahoma, according to newsok.com. One of college football's most talented wide receivers, Green-Beckham (6-foot-6, 225 pounds) was twice arrested on drug charges in two years at Missouri, and was ultimately dismissed from the program after he was implicated, but not charged, in a burglary investigation. Under NCAA rules, transfers that move from one FBS program to another must sit out one season. So a move to Oklahoma would mean Green-Beckham would miss the 2014 season while redshirting at OU, and return to the field in 2015. If Green-Beckham transfers to a smaller FCS program, he could be eligible to play immediately. Those two options alone make for a tough decision, and are compounded by yet another possibility reported by CBS Sports: that Green-Beckham is considering sitting out the year in anticipation of declaring for the 2015 draft. He would be eligible to enter the draft as an underclassman three years removed from high school. Green-Beckham caught 59 passes for 883 yards and 12 touchdowns last season to help spark Missouri's unexpected run to win the SEC East and meet Auburn in the SEC title game. The report is ambiguous on whether the interest is on Green-Beckham's part, Oklahoma's, or mutual. The source is cited as someone "with knowledge of Green-Beckham's situation." That's a fairly clear indication that the information is coming from the Green-Beckham camp rather than from the OU football offices. Taking on a transfer with Green-Beckham's track record would definitely draw some public fire for a high-profile program like OU, so Sooners head coach Bob Stoops is likely to be asked about the possibility the next time he is available to reporters. His answer might provide the best indication yet of what the gifted pass-catcher will do this fall. For now, Green-Beckham isn't talking.